Run Time: 85 Minutes For ARMORERS and NEW SHOOTERS alike…380 pocket pistols have become very popular with the increase in concealed carry. They are generally light and compact. 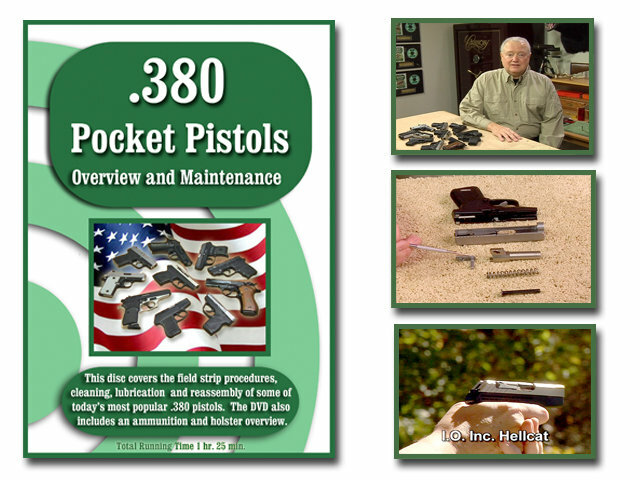 This DVD’s main menu gives you the option to select (1) an overview of pocket pistols including cleaning, lubrication and ammo selection, (2) field strip procedures for ten 380 pistols and (3) an overview of holsters. The firearms covered on this DVD include: Kahr P380, KelTec P-3AT, I.O. Inc. Hellcat, Ruger LCP, Taurus TCP, Smith & Wesson Bodyguard 380, Sig Sauer P238, Colt Mustang, Bersa Thunder 380, Walther PPK, and the Browning BDA. With this DVD, most gun owners can perform a field strip, cleaning, lubrication and reassembly with confidence simply by following the easy to understand instructions. On-Target’s DVDs are digitally produced and provide clear and concise instructions. We at On-Target take great pride in the up-close videography of each DVD.